Rob Bell had Zack Exley on his podcast a couple of months ago. The topics of discussion ranged from Exley's work on the Howard Dean, John Kerry, and Bernie Sanders campaigns to evolving campaign tactics to his current project to get hundreds of ordinary citizens to run for political office at every level. I was intrigued by what he said, because he painted a picture of a cutting edge way to approach politics and pursue societal change, and because he freely shared his critiques of both major parties and how insular and risk averse those in the inner circles at the top tend to be. 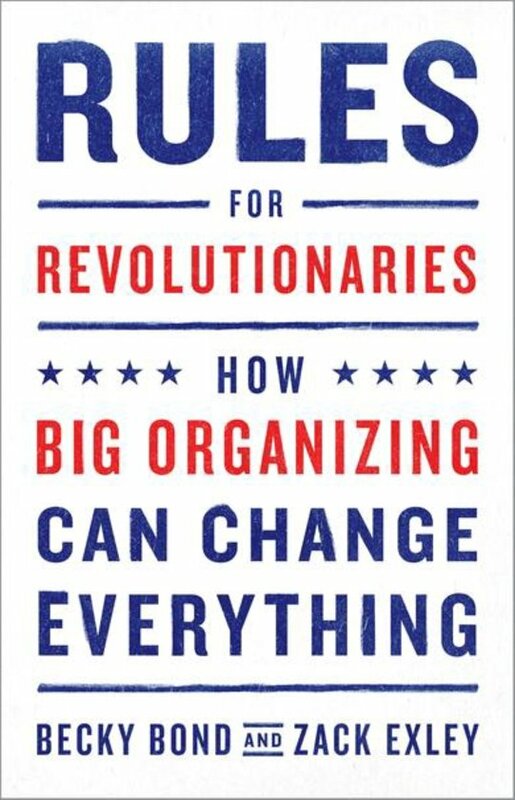 Near the end, Exley plugged the book he'd written with fellow organizer Becky Bond entitled Rules for Revolutionaries: How Big Organizing Can Change Everything, which I'd placed on my to-read list soon after. It's not a book I'd typically want to pick up, simply because the genre of contemporary political commentary is not what I choose to read for fun. But the way Exley cast a vision in his conversation with Bell for grassroots organizing on such a massive scale, I decided that I wanted to take a look. And then, by happenstance, the book review network I'm a part of offered it up. Exley and Bond begin their work by making the case for what they call "big organizing," which they present as bold, innovative, reliant on a vast network of individuals and groups at the local level to keep driving it, and pursuant of sweeping change. In their words, in big organizing people work on "a plan so big it can only be accomplished when everyone who wants change (a majority of the people) works together" (p. 2). The authors suggest that there is actually a sizable enough bloc of people in this country spanning differences that, given the right kind of organization, empowerment, and motivation, could change our nation's direction even without the usual trappings of traditional systems and practices. Off the bat, the authors stress that in order for these tactics to work, people have to want them to work. They have to put in the time and effort needed to pursue them, and to partner with others who want to accomplish the same goal. But Exley and Bond are very clear from the first chapter on that nothing will be handed to those who want change. As the title suggests, these elements of big organizing are presented as rules. Every chapter after the first takes its title from a rule, where an explanation with anecdotes and illustrations follows. The first couple of these drive the point home that the revolution will not happen on its own or with ease. It will involve people who want it to make it happen. After these initial buckets of cold water are thrown on the reader, they turn to the more practical matters of big organizing, many of which may sound quite different from what people are used to if they've been a part of such movements. They take pains to show how reliant on volunteers rather than staff this method is. Especially at first but through its duration, the authors stress that their model counts on unpaid manpower to achieve much of what it sets out to do. Local volunteers know their communities best, and will do much better than outside consultants coming in to present a logo and some slogans. Other rules are in this same spirit. They advocate for small donations from ordinary people rather than constantly wining and dining big donors who will resist the change you want later on. They make the case for local organization but centralized messaging. They advocate for the perfect not being the enemy of big and risky ideas and actions. And they caution against "single-issue" thinking, noting how interconnected things like immigration, civil liberties, income inequality, and access to healthcare actually are. Because Bond and Exley both worked on the Bernie Sanders campaign, many of their examples come from that experience. While some may appreciate seeing what these ideas look like in practice in this way (both successes and setbacks), some may actually have trouble with this given how that campaign eventually faltered. I couldn't avoid Sanders' loss clouding the lens through which I read. There was also more than one instance where the authors would express regret for missed opportunities, hesitation, or poor decision-making, saying, "If we had seen this rule through to its full extent, things could have gone better." Of course, neither the reader nor author will ever know that for sure. Should these rules be discounted given the end result of their implementation in this case? Probably not. I got the sense from this book that Bond and Exley learned a lot from what they did and know how they'll try doing it the next time. But that question still might be enough for some to hesitate on what they present here. Both reference work prior to what they did with Sanders that was more successful, and some may be able to read this knowing that sometimes these rules work and sometimes the human factor or other particulars are too much to overcome. If nothing else, Rules for Revolutionaries shows us how things can be different if enough believe in and work toward a common cause. They may work or they may not given a certain context and the level of commitment and energy of its players. But as Bond and Exley say at the beginning, none of this will happen on its own. These rules are to be remembered in the midst of the struggle, because that's what it will be.